Although that is very depressing, the good news is that there are school districts across the country working to close this gap. When you say effective PK-3 in a large urban district most people think of Boston–and for good reason. If you haven’t seen it, check out this great report on the work in Boston. But there is good work happening in many other places across the country–including down in Texas. I had the privilege of visiting Dallas ISD recently and got a close up look at the work they are doing to ensure every child has access to great teachers. There is a new report from CORE, a research and evaluation center at Southern Methodist University. It provides compelling evidence that providing students with effective teaching for multiple years can help ensure they are on track in their academic performance. For more details see the full report, Effects of Sustained Quality in PreKindergarten, Kindergarten, and First Grade in DallasISD. Dallas ISD has defined (and measured) effective teaching using the Classroom Assessment Scoring System (CLASS), which focuses on the daily interactions among teachers and children that support their social, cognitive, and academic development. CLASS is used across the country and backed by over 200 peer-reviewed studies. Although CLASS is used by Head Start and in at least 23 state Quality Rating and Improvement Systems, there are fewer examples of using CLASS in K-12, despite plenty of research demonstrating the potential. That’s why the work in Dallas is so exciting! 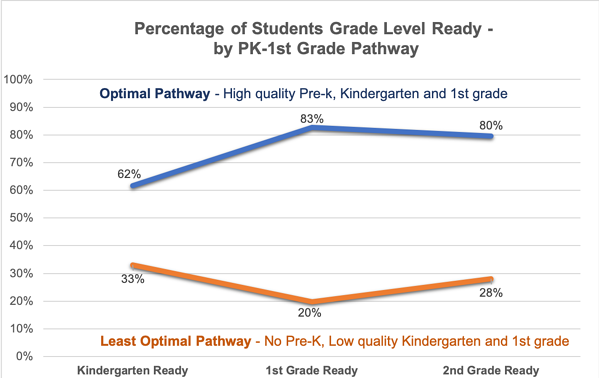 As you can see in the graph below, the study followed children in Dallas ISD from Pre-K to the end of first grade–assessing whether they were “on track1” at K entry, end of K, and end of 1st grade. The study demonstrated profound differences in children’s performance based on their experiences during these critical early years. Children who had the optimal path–access to effective teaching in Pre-K, K, and 1st grade were almost 3 times as likely to be on track at the end of 1st grade as were their peers who were not in Dallas ISD pre-K and then had ineffective teaching in K and 1st grade. In this initial study, only 277 children were in that optimal pathway. But for the last 4 years Dallas has been working to change that–using CLASS and a focus on curriculum to help close the opportunity gap in their schools. Dallas ISD is making progress towards the ambitious goal of ensuring every student has access to great teaching. When Dallas ISD started the work in 2015 only 40% of their Pre-K teachers provided effective instructional support to children (scoring at least a 3.25 on the Instructional Support dimension of CLASS). As of fall 2017, that number was up to 60%. And in 2016 they started working with K, 1, and 2nd grade teachers as well. Across grade levels they are seeing notable improvement in CLASS scores–which means more children are experiencing the “optimal pathway” in the early years of schooling. So how are they doing it? Here is the short answer, you’ll have to stay tuned for my next blog to hear more, including some excerpts from interviews with Dallas ISD staff. In Dallas that meant focusing the whole system on teacher-child interactions, using CLASS, as well as adopting and implementing new curricula that help ensure children are being taught critical early skills in literacy, math, science, and social emotional learning. Dallas has offered most Pre-K teachers and many K-2 teachers the evidence-based PD program called CLASS Group Coaching (a.k.a. Making the Most of Classroom Interactions-MMCI) in which teachers learn about each of the CLASS dimensions, see examples of effective and less effective practice, and get opportunities to try it out in their own classrooms. 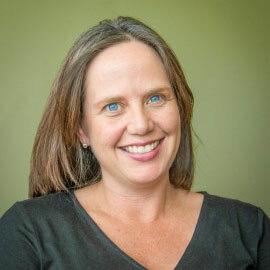 And they have developed a large cadre of amazing coaches to support teachers–helping to ensure that every teacher takes the learning back into their classrooms and makes meaningful and lasting changes to their daily practice. The partnership between Dallas ISD and CORE at SMU is one of the best examples I’ve seen of a true research-practice partnership. SMU provides Dallas with regular, actionable data that helps them know where they are making progress, and where they need to invest more attention. Next time, I’ll share more about what Dallas’ work looks like in action–and hear from the people doing the hard work. 1 Children’s “on track” status was assessed through the Istation’s ISIP literacy assessment and the Terra Nova standardized assessment.